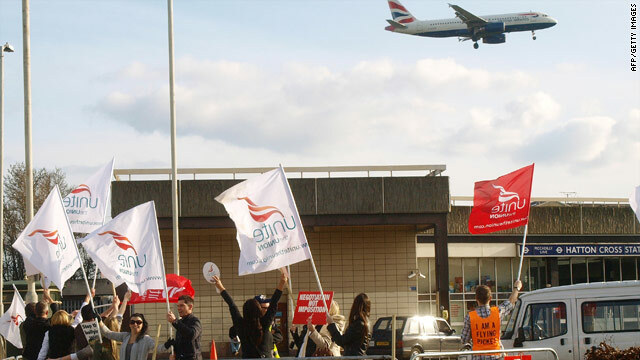 A BA plane approaches Heathrow Airport in London in front of a Unite union picket. Union says BA hub at London's Heathrow Airport like a "ghost town"
London, England (CNN) -- Both sides claimed victory in a bitter dispute between British Airways and a union representing cabin crews as a strike ground into its third and final day Monday -- the first working day when the strike has been in place. Unite, the union which represents 95 percent of BA cabin crews, said only nine crew members turned up for work Sunday out of 1,100 scheduled to be on shift. The union claimed 140 planes were parked at Heathrow, London's main airport and BA's hub. And the union claimed most long-haul flights leaving the UK were "ghost flights" with no passengers. "By midday (Sunday) 49 flights out of London Heathrow were empty," the union said in a statement. "All long haul-flights suffering delays as BA wait for crew -- any crew -- to turn up," the union said. The airline gave a much different picture, reporting that "over the first two days, the airline operated ... 78 percent of its long-haul flights and ... 50 percent of its short-haul flights." The airline said "many aircraft are now departing full," attributing the success to contingency plans in place ahead of the strike. "Cabin crew are continuing to report as normal at (London's second airport,) Gatwick, and Heathrow levels remain above what we need to operate our published schedule," the airline said in a statement Sunday afternoon. BA revised its flight schedule in advance of the strike, planning to run 60 percent of its normal schedule from Heathrow. It claimed it was adding flights back into the schedule "due to the numbers of crew reporting for work." Unite opposes British Airways plans to restructure, saying the reorganization will lead to job cuts. Stock analysts have quoted BA managers as saying that the dispute is not only over costs but who ultimately will control the airline's operations -- management or the union. Are you caught up in strike? British Airways, which is expected to be hit by a second strike beginning March 27 and lasting four days, has drafted in an army of volunteers to staff flights and has leased aircraft and crew from other airlines to operate scheduled services. Passengers interviewed by CNN after taking a BA flight from London to Atlanta on Saturday said the journey had been smooth and offered praised for the level of service they received in flight. British Airways and Unite have been at odds for more than a year over changes the airline wants to make to cabin crew pay and work practices. BA says the changes will save the company more than £60 million ($90 million) a year. But Unite has said the plans, which call for longer working hours and a cut in crew staffing levels, will damage customer service and the BA brand. BA CEO Willie Walsh and the joint general secretary of Unite, Tony Woodley, met late into the night Thursday and again Friday, but failed to reach a compromise to avoid the strikes.